What would life be like without cars, television, the Internet and computers, or the omnipresent smartphone? Setting aside the question of whether things would be better or worse, what we do know for sure is that today there are some inventions that we just can't do without. And yet some of them are very recent, in their infancy we might say, while others are a little over a century old, which in any case is but a blip if compared to the history of humanity. They all have changed the existence of a considerable number of people, their advent has been such a breakthrough that it has always marked a "before" and "after". The result of the brilliant intuition of exceptional men and women, of the perseverance and tenacity of great entrepreneurs or ingenious ideas of common people, these inventions have influenced and changed medicine, society, economics, culture, and history itself. 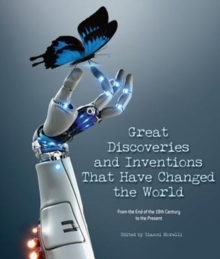 This book full of curiosities and explanations will guide readers to the discovery of the most important inventions that have influenced the contemporary world, from the end of the 19th century to our own time, revealing the secrets and events that led to their creation and introducing the exceptional figures who conceived them.